I promise to continue with the challenging behavior series in the future, but there are always so many things I want to write about! Sometimes I feel like my brain will explode from ideas…and I get bored talking about the same thing all the time, so I ask you to be patient with me and indulge me. Today’s burning topic in my head is about creating effective home communication systems. Clearly this is something that is important for all classrooms and all teachers. However, it’s something that really hits home for families and teachers of students with special needs of all kinds. Let me start this topic by addressing 5 of the reasons (there are more) WHY it’s so important. Building relationships among parents and teachers is the heart of a good educational experience for all students. I know parents who have been frustrated with not feeling connected to their child’s school experience. I also know many teachers who are frustrated by the lack of engagement by some parents in their child’s school experience. Trust me, like any good relationship, it goes both ways. When teachers are trying to figure out the boundaries of the relationship with some parents who want to be involved in every decision throughout their child’s day, I try to remind the teachers of how frustrated they are with parents can’t or won’t communicate with them about their child. Children (all children) do better when home and school are both supportive of the child’s education. Building a successful relationship with a parent can mean the difference between having a student’s bad day be a team discussion for problem solving or having it be a reason for due process hearings. I’m not saying relationship building will prevent all due process, but it certainly lays the groundwork for positive, proactive strategies. These students can’t come home and tell their parents about what happened that day at school, in the same way they can’t come to school and tell you about their evening or weekend. Even our students who are verbal can’t always order events and tell us a story about what happened. This means that their parents don’t always get a lot of feedback from them about they did at school. Our students often have limited communication skills to be able to tell their parents about their day. It’s also hard to support students’ communication when you don’t know the topics of what they can talk about. If you know that the child went to an amusement park or carnival over the weekend, you can help them communicate their experience by having visual cues and other supports ready for the conversation. If you don’t know where they went, you are left guessing what they might be able to or trying to tell you. It also means that it’s hard to ask questions and help students answer them accurately or provide communication supports for them to answer them. If I don’t know where he went over the weekend, I can’t make sure his device or pictures can support his answer. As a parent, if I don’t know what he did at school, I can’t support his sequencing to tell me about it. Students with autism, as we all know, struggle with generalizing their knowledge from person to person and place to place. I have known many children who have learned a skill at home and don’t do it at school and I’ve known many who learned it at school and can’t demonstrate it at home. Providing consistency in programing for our students is essential, and communication is a big piece of that. Parents are giving up their children for 6-8 hours a day in an environment they may not know that well. If you have your own children, think how scary that would be if you didn’t know the teacher, particularly if your child couldn’t come home and tell you about something that bothered them at school. Our students (regardless of functioning levels) are particularly vulnerable. Fostering a feeling of safety is important for our students and their parents, and communication and transparency is the best way to assure that. 5. We are a team! Finally, one of the most important reasons for building effective home-school communication is that we need a team. Our students can’t go it alone. There is too much to learn and too much to do to expect one part of their life to teach it all. 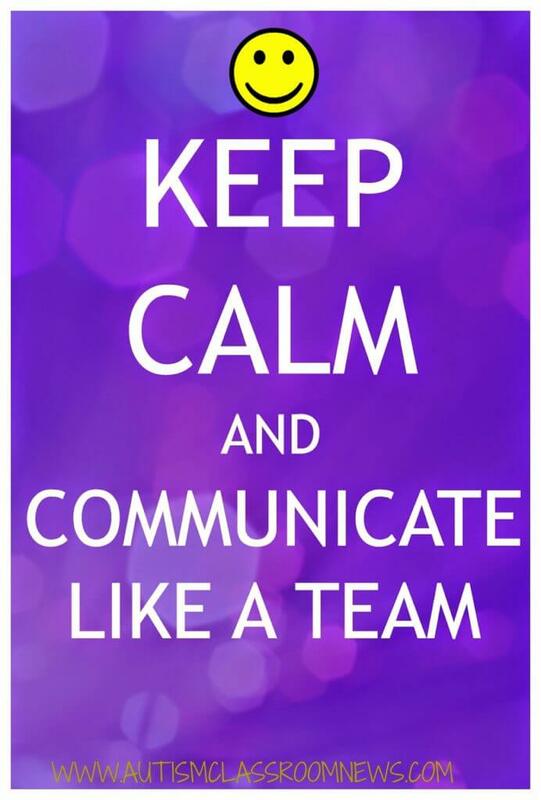 Communication between team members is the only way that collaboration happens. Remember always that it’s all about the student. The student has to be the center of everything we do. To support the student, we have to communicate effectively. And it’s a two way street. If you are a teacher, send home information about what you are doing and seeing in class. If you are a parent, send school information about medication and routine changes that might affect your child’s behavior and performance at school. And if one or the other parties isn’t giving you the communication you need, tell them. If that isn’t effective, try to understand the time constraints they (parent and teacher) are working with and be understanding. And don’t let one party’s lack of communication be a reason for you to stop communicating. Take the high road and know that you have done what you can do to help this student. OK, I think that’s enough impassioned rambling for the day, huh? I’ll follow up with a couple more posts this week and maybe next focusing on methods we can foster communication between settings, dos and don’ts for communication, and an overview of the home-school communication notes I just posted in my store that got me thinking about the topic again. 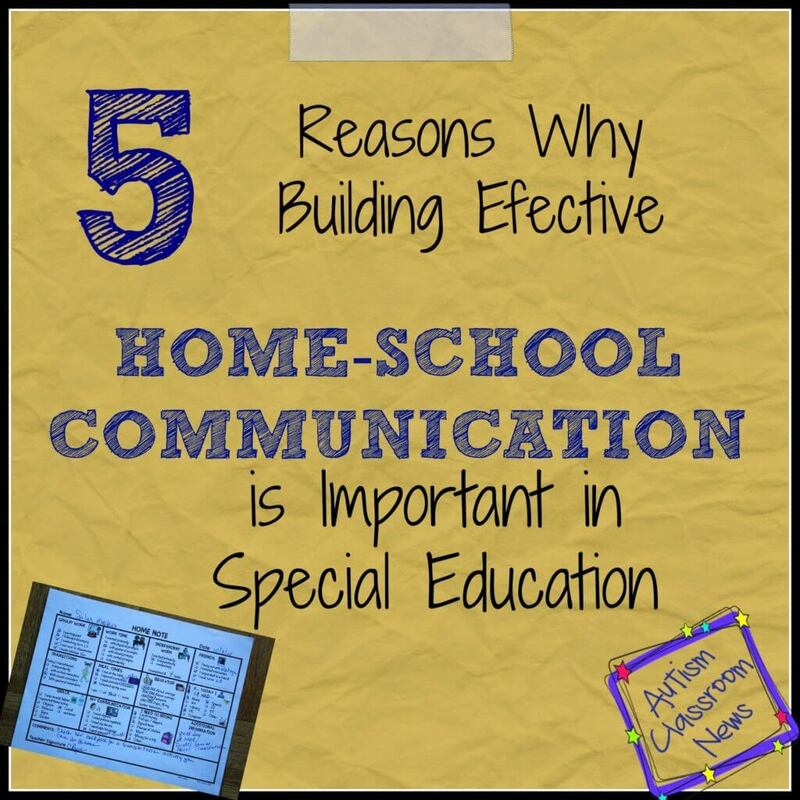 In the meantime, what are some reasons you think home-school communication is important? What are the barriers to it being effective? Please share in the comments so we can all continue to grow. Great post! We just made parent communication our team goal for prof. development time! I'm bookmarking this one! I'm so glad you liked it—check out tonight's post for do-s and don'ts of communication and an upcoming one on different types–I loved your newsletter which is one of the types I'll talk about. Cool stuff! Thank you for writing about this. This really hits home for me. My son started kindergarten this year and is in special education. He has Autism and speech Apraxia as well. Although he is verbal, there is still a communication barrier, where we have a hard time understanding him. He also has a hard time telling us about his school day. Unfortunately, I am having a very hard time with getting the teacher to communicate with me. I have been made to feel like a complainer and that I am wrong for wanting to know about my child's day. Unfortunately, I have had to get the superintendents office involved because my son's IEP has not been followed and I feel that they are trying to keep me from knowing what is going on at school. It's a shame that I have to struggle just to get good communication. There were several incidents when my son came home upset and angry…he could only tell me bits and pieces of what happened so I wrote in the "communication" book asking what happened that made him so upset, especially since the teacher wrote "good day". My son told me that he ran out of the class and building (which at home, he always runs and hides when he gets mad or upset. ..given the fact that this is a common thing he does at home, I believe him…he wouldn't just make it up. Plus his one classroom is right next to the exit door. BUT his Teacher denied it happened. There were a few incidents that the teacher said he had a great day but he said otherwise. During a recent meeting, the teacher had the nerve to say to me that I need to trust them. I went on to say that it's not about trust, I just need to know what is going on in school so I can effectively communicate with my child when he is trying to tell me about his day. (Obviously, trust is very important, but the teacher was trying to use it as an excuse to not have to tell me about my child's day). It is written in his IEP that they are supposed to have daily communication… however the teacher only gives very vague details. Will only say "great day" and will rarely tell mmeof a problem.. But there has been times where she is not honest. The incident where my son ran out of the building, she first told us that it happened in his general education class ( which is right next to the exit doors) and then during a recent meeting, told us that the incident took place in his self contained class. The teacher also openly said that she questioned my son about what he told us happened. Since then, he is saying that he didn't run outside of the building. I feel that she intimidated him. .. Between not being honest about what is really going on during his day, to not following his IEP and unwilling to give any meaningful daily communication, I feel like I am being left in the dark. I should not have to beg for knowledge about what is going on in school, especially from a special education teacher. I am sure that my son is not the first child that has communication needs. I am sorry for the long post but I just wanted to let you know that everything you wrote is exactly what I am trying to get from my son's teacher. It upsets me that they do not understand the importance of home to school communication. Especially a special education teacher nonetheless. I am also sure that I am not the only parent that goes through this. So thank you again for writing about this topic, I plan on using these reasons at my meeting to help with advocating for much needed communication.